How do I find traders? Which? 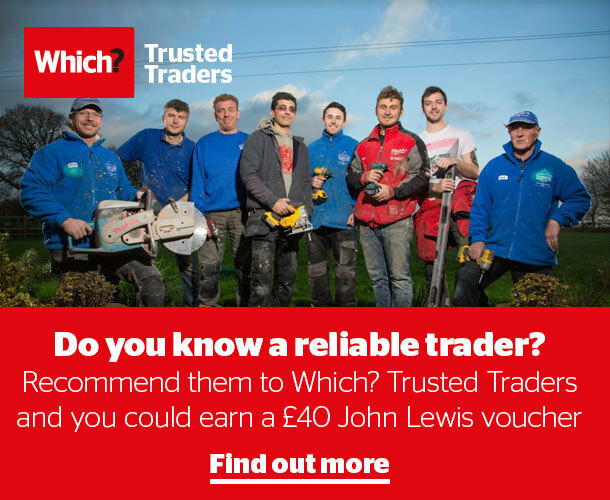 Trusted Traders is an endorsement scheme that recognises reputable traders in the home improvement and motor industries, such as plumbers, mechanics and kitchen installers. Which? Trusted Traders aims to raise standards for consumers, by setting a benchmark we expect all traders to meet before they can be endorsed. All traders who meet our standards process can become a Which? Trusted trader and can display our Which? Trusted trader icon on their branding and promotional material. Find a Which? Trusted trader to help improve your home, repair your car or your property. Read on for more reasons to choose a Which? Trusted trader. Which? Trusted Traders helps you find a trustworthy trader that you can rely on, giving you the reassurance that they have been endorsed by a respected consumer organisation. All Which? Trusted traders go through our standard assessment, which involves checking their references and qualifications. We ensure they have appropriate insurance in place, do a credit report and get feedback direct from a random selection of their existing customers among other checks to ensure their business is in good shape. In addition, all Which? Trusted traders have to comply with our code of conduct. If they do not, they can be suspended or removed from the scheme. Should anything go wrong, all Which? Trusted traders are members of an alternative dispute resolution service, which gives you recourse to an independent ombudsman in the unlikely event of a dispute. It’s free. Whether you're a Which? member or not, everyone is welcome to use Which? Trusted Traders to find local, endorsed traders. Which? Trusted traders all have profiles on our website, which include their contact details, business websites, information about their business, pictures of their work and reviews from other users. All the reviews are moderated for authenticity, and we welcome both positive and negative feedback for Which? Trusted traders. You can find Which? Trusted traders in your area by searching for the specific trade you need, such as plumbers, electricians or mechanics, together with your postcode or local area. Which? Trusted Traders - stop looking, start finding.